Dual Keyence CV5000 series vision controllers with high resolution cameras programmed to inspect the quality of cellophane seals, check packages for contamination and to verify the presence and/or correct assembly of medical devices. The system was programmed to save failed images and to report pass/fail data to customer's computer. 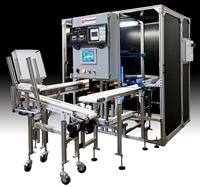 The system used two VFD controlled conveyors to advance parts through two independent inspection stations. Good parts were transferred out to an unload shingling conveyor to the operator. Rejects were contained inside two electrically interlocked drawers in the cabinet.